PDF Watermark Creator (A-PDF Watermark)is a great tool that allows stamping text or image as a logo watermark into PDF files. You can design your logo watermark with everything you like, such as company logos, file names. Clear the PDF files status: draft, final version, and etc. Make the PDF files distinguish from others’ with your own logo. Protect the PDF files from copying. Set the text properties and position in margins. Set the page range: whole, odd/even page, page n-m.
Set the page scale before applying watermark. PDF Watermark Creator supports creating watermark only show for printing. 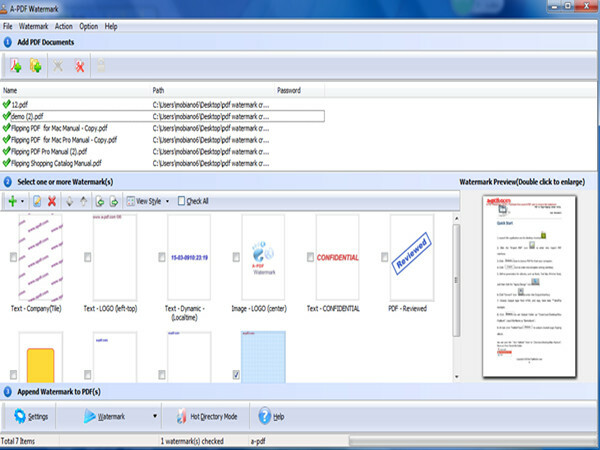 Besides, it is convenient to transfer output PDF files to FTP or E-mail them directly. You can use the logo designed before and batch stamp it into PDF files at one time. You only have to enable and customize watermark features through PDF Watermark Creator. PDF Watermark Creator is an independent program that promotes quickly stamp a logo watermark into PDF files.